Texas-based U.S. 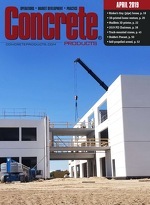 Concrete, Inc. has named John Kunz as senior vice president and chief financial officer. His 30-plus years across financial disciplines include experience in accounting, tax, capital markets, corporate governance compliance, public company reporting and internal controls. Kunz most recently served as vice president, corporate controller and principal accounting officer of Tenneco Inc., where he was responsible for a team that handled all corporate and business unit accounting functions—consolidations, financial planning and analysis, and Securities and Exchange Commission reporting among them. Previously, he was vice president, Treasurer and Tax, responsible for overseeing the company’s capital structure, liquidity and global tax function. He also held finance department positions at Great Lakes Chemical Corp., Weirton Steel Corp. and KPMG LLP. Kunz is a member of the audit, compensation, and nominating and corporate governance committees under the Wabash National Corp. board of directors. Odessa, Texas-based PB Materials Holdings Inc. (PMB) has closed on the assets of three Lone Star State peers in ready mixed concrete and sand & gravel. The combined plants, fleets and reserves of ARM Concrete and Kermit Concrete, both Lubbock, and WUUD Aggregate, Kermit, provide additional vertical integration throughout PBM’s west Texas and eastern New Mexico market footprint. “The operations are a sound fit with our base in the Permian Basin and further allow PB Materials to provide high quality service and construction materials to our customers in the region,” says PBM CEO Christopher Crouch. Gate Precast Co. recently named David Baker as design assist sales and management representative and Phil Dorsch as project manager in its Kissimmee, Fla., operation. The 60,000-sq.-ft. Kissimmee plant is among eight Gate Precast operations engaged in design, engineering, fabrication, transportation and erection of architectural and structural precast concrete systems. Baker served for 11 years as plant manager for the Jacksonville-based producer, and holds PCI Level III and Grade 1 ACI Field Testing Technician certification. Prior to precast concrete, he worked in the aerospace manufacturing industry for United Technologies and Pratt and Whitney Aircraft. Dorsch was superintendent/erection manager for Gate’s Florida operations, and has 42 years of experience in architectural and structural precast erection across Midwest and Southeast markets. Iowa-based precast sandwich panel specialist Zero Energy Systems has appointed Kevin Wadley, P.E. to the post of vice president, Engineering. Licensed in five states, he has been practicing in concrete structures for 13-plus years, and will use his design experience in advancing Zero Energy’s high performance, edge-to-edge insulated, structural concrete wall panel systems. High-performance, packaged dry mix specialist Ardex Americas has released product data and specifications to architects, engineers and design professionals through Arcom software platforms. Arcom-customized versions of MasterSpec sections enable users to accurately specify mortar, grout and other cementitious products from Ardex. Along with specification sections, Ardex product catalog and data sheets are easily accessible to project specifiers. Cemex S.A.B. de CV ranks 18 on the Fortune 2017 Change the World List of 50 companies worldwide that have had positive social impact through activities central to their core business strategies. The magazine recognized the producer’s efforts to foster sustainable building practices through the “Growing” platform, which encompasses social and inclusive businesses geared to fighting poverty, low quality education, unhealthy homes, unemployment, poor access to financial aid, and lack of civic participation. By 2016, such efforts had netted affordable and dignified housing to 3 million-plus in Latin America. “[The] platform has enabled us to work across our value chain with governments, micro-finance entities, low-income communities, and social entrepreneurs to build over 4 million square meters of livable space,” affirms Cemex CEO Fernando Gonzalez. The 2017 Change the World List was compiled with the help of non-profit consulting firm FSG and its Shared Value Initiative organization. Researchers selected companies on these criteria: measurable social impact; business result in terms of profitability of the socially impactful work; and, degree of innovation. Cemex joined J.P. Morgan Chase, Apple Inc., Walmart, Johnson & Johnson and Toyota Motor among the top 20 Change the World companies. Others linked to construction on this year’s ranking are CH2MHill and Grohe.